A trying ten and a half hour march covered just 10 miles. The day was tropical again. Delays were caused mainly by the habit of artillery units stopping and feeding every time they came across water. While his troops struggled, Gleichen trotted ahead to recce Morienval. Here he enjoyed “an excellent potage aux choux and a succulent stew, with big juicy pears to follow, all washed down by remarkably good red vin de pays”. He’s a boy, is our Count Gleichen. The 15th Brigade was marching to their original billets in Béthisy, on the southern tip of the Compigne Forest, when they were redirected to Crépy-en-Valois. The reason for their new destination was that German cavalry had entered Béthisy, chasing out the billeting parties. The Germans were later cleared out by British cavalry. But it appeared that the enemy was getting closer. Another of the excellent photos posted by zombikombi1959 on Flickr. On the retreat from Mons. Bivouacking at Bontrueil (?). About 31st August. Bn. HQ servants. My servant, Pte. Randall on left with cap. Once at Crépy-en-Valois they bivouacked in fields in a south-west district called St Agathe. There’s a park in this vicinity with the same name so I’ve plonked Frank there for the night. Gleichen’s gastronomic tour of North East France comes to a disappointing end when he spots a couple of bottles of wine bottles and glasses. “Nearly speechless with thirst, we rushed at them. They were empty!”. At 2:20am the retirement continued “via Attichy to Croûtoy”. It was a tough march, for the most part on open downs with little shade. After struggling up a hill for 2 miles, they halted in a field half a mile south of Croûtoy and mention is made that no supplies had been delivered. It was 8am. The weather was blistering hot again and Gleichen comments that the “heat was terrific” in the stubble fields. Eventually, at midday, the 15th Brigade were told they could head back to the relative cool of “shady little” Croûtoy. Here Gleichen enjoys a “real big bath with taps and hot water” in the local château. I think the troops, who received nothing, would have been pleased to hear that he lost one of his horses, along with a load of kit, filched by a staff officer. Captain Kevin Darling, horse thief? Contemporary accounts at this time constantly refer to the lack of rations. “Oh it was chronic. There were no rations”and “it was impossible for rations to reach us. We had to resort to looting” are just 2 quotes from Lyn Macdonald’s 1914 book. The Dorsets still had no idea about why they were retreating but “the possibility of a wash and shave was uppermost in the minds of all ranks”. I don’t think they would have really cared at this point. – no address, but date stamped Army Post Office 28(?) August 1914 and stamped Passed by Censor No 137. Ordinary postcard with pencilled message above space for stamp “Will pay the other end” with another ink stamp Paid 8 Sp 14. Thanks for your welcome letter which I was pleased to receive. We are in rather warm quarters at present. I am getting on alright up to now, remember me to all at home and give them my best, did Aunt get that PC which I sent her. The weather we are getting over here is not hot and we we have had not much rain. Thank May for her letter which I was pleased to get. We have been here over a fortnight now and I don’t know when we shall pack up. Now I must conclude trusting to hear from you soon, send me out a tooth brush mate (?) Don’t be long in writing. So here is Frank’s first surviving letter home. It’s only a quickly scribbled, ordinary postcard but it must have been like gold to Mabel. You might have noticed that the postcard is possibly marked 28th August. As I don’t have the originals, only transcripts, I can’t be sure of the exact details, but I think it much more likely that it was written on the 29th August. Today was a rest day for the Dorsets, their first since arriving in France 10 days previously. Frank says 2 weeks but he must have been exhausted. By my calculations they have marched about 120 miles already. Most of these letters are to Mabel, his sister, and all address her as Till. The Aunt is probably Caroline Webster (1879-1967). She’s also referred to as Carrie or Auntie Muff. Geoff remembers an Auntie Muff form the 1930s in his notes to these transcripts. May appears to be Mabel’s best friend although Frank hints at an earlier falling out between the girls in a previous letter. All he refers to about the last few days is “rather warm quarters”. This reflects the British Army stiff upper lip but also Frank’s sense of humour, which is very dry and full of double meaning. I think the “not hot” reference might be a typo and possibly “hot hot” because the weather was still sweltering. Frank’s request for a new toothbrush highlights the amount of kit the troops had lost. Lyn Macdonald in her book, “1914 –The days of Hope” describes the detritus left behind by the retreating BEF, as they try to lighten their load on the weary retreat. “They dropped greatcoats, ground sheets, spare shirts, clean socks, mess-tins, mugs, knives and forks.” The Dorsets had already lost their packs in Mons, along with their greatcoats and spades, in the first trenches they defended. One of the excellent photos posted by zombikombi1959 on Flickr. A halt during the retreat about 31st August 1914. 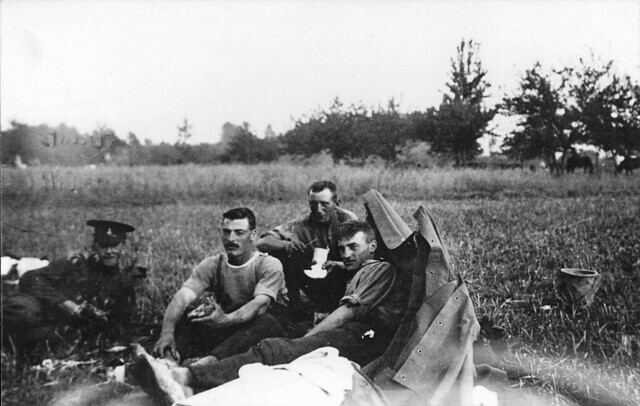 Lt-Col. Bols (sitting), Sgt. Miller standing and leaning by him. 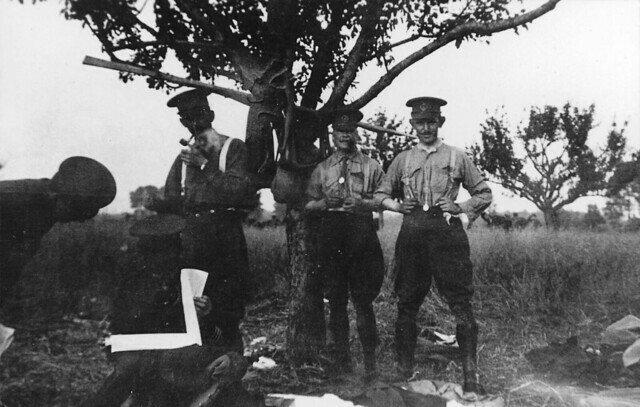 Maj. Roper (with pipe), 2 i/c. Capt. Fraser commanding ‘A’ Coy. Capt. A.L. Ransome (1st Bn. Dorset Regt.). Date was 29th August. We halted most of the day but had to move soon after 5pm. The Dorsets remained in Pontoise, in an orchard on the southern bank of the Oise. New kit was requisitioned and equipment got a good clean. Casualty lists were dealt with for the first time. Sadly, their idyll came to an end at 5:30pm, when they got orders to march to new billets in Carlepont, only 4 miles away. Due to a mix up between the 14th and 15th Brigades, the Dorsets ended the night bivouacked along the main street and “got little rest”. It was a depressing end to a day that promised a small return to normality. As the Dorsets marched on the morning of the 28th August they passed the Commander of the BEF himself. Sir John French spoke to troops as they past. He roundly praised them, promising them “three days rest”. Of the British solider, he says in his memoirs, “it touched me to the quick to realise how, in the face of all the terrible demand made upon their courage, strength and endurance, these glorious British soldiers listened to the few words I was able to say to them with the spirit of heroes and the confidence of children”. At lunch the Brigade stopped and had a longer rest, for the day was very hot again. Some joie-de-vivre must have started creeping back into the men as Gleichen narrates, “I remember that Moulton-Barrett went up to St André, who was lying fast asleep, and shouted out, “The Germans are on us!” Poor St André jumped to his feet with a yell and seized his revolver; it was a wicked joke.” Oh, that droll Moutlon-Barrett. St André was the French interpreter to the 15th Brigade. He was a a Protestant pastor from Tours, son of the Vicomte de Saint André. Gleichen was very fond of him – “his English was very fluent, luckily untouched by a Scottish accent.” Charming. St André can be seen here on the left, in a photograph of the 15th Brigade HQ staff. I’ve taken this from the online Project Gutenberg version of Gleichen’s book. I haven’t been able to find out anything else about him at this time. L. de St A. J. T. W. G. A. L. M.-B. R. E. B.
photo by Lieut. H. M. Cadell, R.E. The going was slow. French cavalry were heading in the opposite direction, which caused delays, and they were also blocked by a supply train in Noyon. But eventually they reached their destination, an orchard at Pontiose-Lés_Noyon, and, according to Gleichen, were told that they were going to rest there for several days. They’d marched 20 miles. The fact that French troops were moving north is interesting in that there were obviously other things happening that the Dorsets knew nothing about. I’ve decided to keep quiet about these events so it doesn’t spoil the narrative of this particular story. I will explore them when the 15th Brigade becomes aware of what is happening.